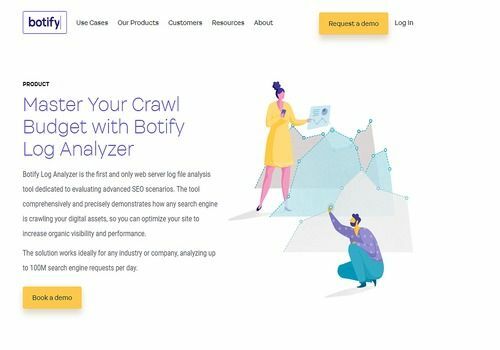 Botify also provides a very complete analytical monitoring tool, which complements or even replaces Google's: The data collected makes it possible to know its pages and their strength and to collect relevant metrics, such as the number of pages viewed... In fact, this tool can replace Search Console because its approach is similar. Software in SaaS, Botify is used autonomously: Uploading of files, import-export of data, competitive analysis... The user is free and can invoke this tool at any time for the follow-up and optimization of his pages. The crawl of the pages will give a list of actions to be carried out, both desktop and mobile and according to different agents. The other tools will no longer necessarily be necessary and the agencies, which are the main target for this tool, will find a good way to avoid dispersal. In short, Botify is a multi-task solution that should be tried before any subscription. This professional tool is intended for SEO professionals with a certain level of competence. Take advantage of a competitive and strategic monitoring tool to improve your SEO. A small cousin of Rm Tech, Rm Sitemaps is a sitemap audit tool that will deliver an ultra-complete report on your site's sitemap.